Today Surgeons and Gynecologist Practicing Laparoscopic Extracorporeal Weston Knot Demonstration By Prof.Dr.R. K. Mishra. 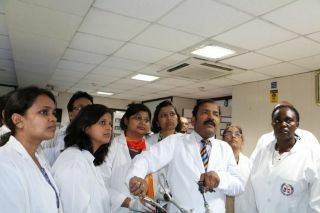 Today under the guidance of Dr R K Mishra the surgeons and gynecologist practise extracorpeal western knot. It is a simple, easy and safe technique. A concern of a secure knoting is obvious by the surgeons and this knot provide them security. a knot should provide proper tissue approximation, should be easy safe and reliable and this is what this extracorpeal western knot is used for. Various step of tying the knot was demonstrated and then it was applied on harvested tissue. The salient feature of this knot is that it slides on its own and a knot pusher is not required. The tail of the suture is pulled in the last to lock the knot.